The Russian language is a Slavic language spoken in Eastern Russia and several ex-republics of the Soviet Union. Russian is an official language in four States: Belarus, Kazakhstan, Kyrgyzstan, and Russia. Attend the Russian language course means relying on a strong tradition in the teaching of russian and teaching methods effective and constantly updated. Our language school online "Language Land" offers individual Russian language courses, intensive or extensive a selection of schedules to meet your needs and reconcile the various commitments of the day. The international certification ТРКИ-TORFL (named also TRKI) verifies the level of competence of the Russian as foreign language. Our qualified teachers help you learn the Russian language to students of all levels, from beginner to advanced. My name is Serghey. I'm Russian native speaker. I speak fluently Italian and English. I have two degrees: Italian and English interpreter. 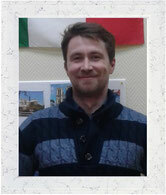 I have the experience of teaching Italian and Russian to foreigners since 2006. I have also worked for 5 years as an interpreter with important Italian companies such as Enel, Leoncini and others. Since 2015 I teach the Italian in the Ural State Conservatory. I am very passionate about lyrical music and singing. On my lessons I try to focus on the communicative aspects. I make the lessons funny and not very demanding. After three months of study with me, you will be able to speak with Italians / Russians about the following main topics: presenting yourself, speaking about family and work, what do you do in your free time (hobbies), what are your preferences in food and clothes, how you celebrate the holidays and what are the traditions / festivals of your country. I’m waiting for you on my lessons! Copyright © "Language Land" 2014-2019, All Rights Reserved.